Exactly 317 year ago, Captain William Kidd was tried and executed for piracy. Whether or not he was a pirate is debatable but what is not under dispute is that people do like to pirate. Throughout the human history, whenever there was opportunity, there was also theft. Wait…, is theft the same as piracy? For Eres et al. (2016), theft is theft, whether the object of thievery is tangible or not. So why are people who have no problem pirating information from the internet squeamish when it comes to shoplifting the same item? First, is it true that people are more likely to steal intangible things than physical objects? A questionnaire involving 127 young adults revealed that yes, people of both genders are more likely to steal intangible items, regardless if they (the items) are cheap or expensive or the company that owned the item is big or small. Older people were less likely to pirate and those who already pirated were more likely to do so in the future. In a different experiment, Eres et al. (2016) stuck 35 people in the fMRI and asked them to imagine the tangibility (e.g., CD, Book) or intangibility (e.g., .pdf, .avi) of some items (e.g., book, music, movie, software). Then they asked the participants how they would feel after they would steal or purchase these items. People were inclined to feel more guilty if the item was illegally obtained, particularly if the object was tangible, proving that, at least from an emotional point of view, stealing and infringement are two different things. An increase in the activation the left lateral orbitofrontal cortex (OFC) was seen when the illegally obtained item was tangible. 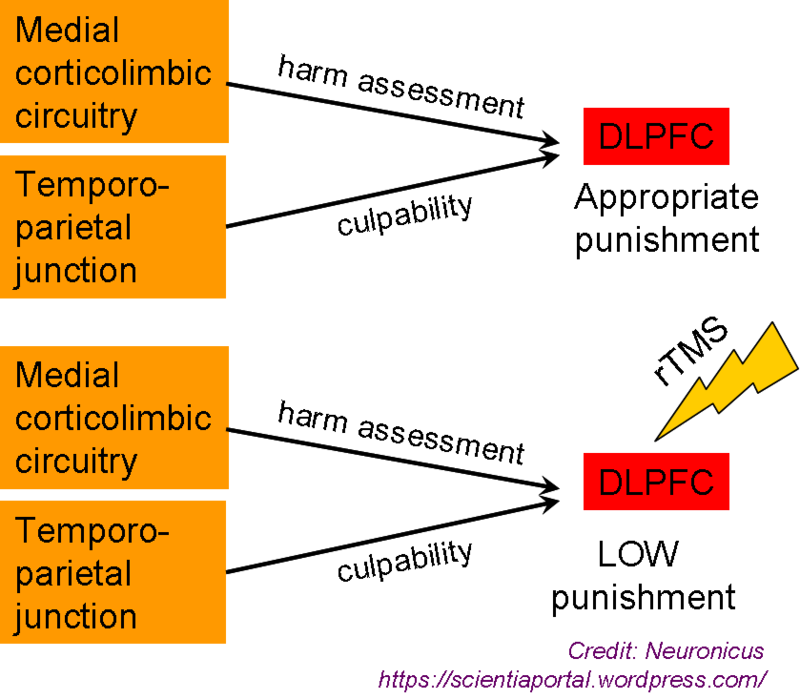 Lateral OFC is a brain area known for its involvement in evaluating the nature of punishment and displeasurable information. The more sensitive to punishment a person is, the more likely it is to be morally sensitive as well. Or, as the authors put it, it is more difficult to imagine intangible things vs. physical objects and that “difficulty in representing intangible items leads to less moral sensitivity when stealing these items” (p. 374). Physical items are, well…, more physical, hence, possibly, demanding a more immediate attention, at least evolutionarily speaking. Like most social neuroscience imaging studies, this one lacks ecological validity (i.e., people imagined stealing, they did not actually steal), a lacuna that the authors are gracious enough to admit. Another drawback of imaging studies is the small sample size, which is to blame, the authors believe, for failing to see a correlation between the guilt score and brain activation, which other studies apparently have shown. A simple, interesting paper providing food for thought not only for the psychologists, but for the law makers and philosophers as well. I do not believe that stealing and infringement are the same. Legally they are not, now we know that emotionally they are not either, so shouldn’t they also be separated morally? And if so, should we punish people more or less for stealing intangible things? Intuitively, because I too have a left OFC that’s less active when talking about transgressing social norms involving intangible things, I think that punishment for copyright infringement should be less than that for stealing physical objects of equivalent value. But value…, well, that’s where it gets complicated, isn’t it? Because just as intangible as an .mp3 is the dignity of a fellow human, par example. What price should we put on that? What punishment should we deliver to those robbing human dignity with impunity? Ah, intangibility… it gets you coming and going. The main argument that religious people have against atheism or agnosticism is that without a guiding deity and a set of behaving rules, how can one trust a non-religious person to behave morally? In other words, there is no incentive for the non-religious to behave in a societally accepted manner. Or so it seemed. Past tense. There has been some evidence showing that, contrary to expectations, non-religious people are less prone to violence and deliver more lenient punishments as compared to religious people. Also, the non-religious show equal charitable behaviors as the religious folks, despite self-reporting of the latter to participate in more charitable acts. But these studies were done with adults, usually with non-ecological tests. Now, a truly first-of-its-kind study finds something even more interesting, that calls into question the fundamental basis of Christianity’s and Islam’s moral justifications. Decety et al. (2015) administered a test of altruism and a test of moral sensitivity to 1170 children, aged 5-12, from the USA, Canada, Jordan, Turkey, and South Africa. Based on parents’ reports about their household practices, the children had been divided into 280 Christian, 510 Muslim, and 323 Not Religious (the remaining 57 children belonged to other religions, but were not included in the analyses due to lack of statistical power). The altruism test consisted in letting children choose their favorite 10 out of 30 stickers to be theirs to keep, but because there aren’t enough stickers for everybody, the child could give some of her/his stickers to another child, not so fortunate as to play the sticker game (the researcher would give the child privacy while choosing). Altruism was calculated as the number of stickers given to the fictive child. In the moral sensitivity task, children watched 10 videos of a child pushing, shoving etc. another child, either intentionally or accidentally and then the children were asked to rate the meanness of the action and to judge the amount of punishment deserved for each action. “Family religious identification decreases children’s altruistic behaviors. 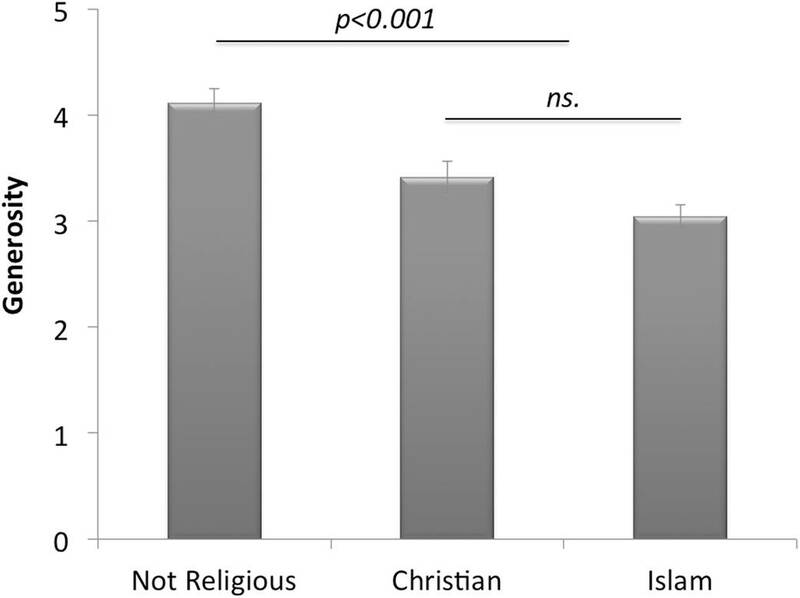 Religiousness predicts parent-reported child sensitivity to injustices and empathy. From Current Biology (DOI: 10.1016/j.cub.2015.09.056). Copyright © 2015 Elsevier Ltd. NOTE: ns. means non-significant difference. Parents’ educational level did not predict children’s behavior, but the level of religiosity did: the more religious the household, the less altruistic, more judgmental, and delivering harsher punishments the children were. Also, in stark contrast with the actual results, the religious parents viewed their children as more emphatic and sensitive to injustices as compared to the non-religious parents. This was a linear relationship: the more religious the parents, the higher the self-reports of socially desirable behavior, but the lower the child’s empathy and altruism objective scores. Childhood is an extraordinarily sensitive period for learning desirable social behavior. 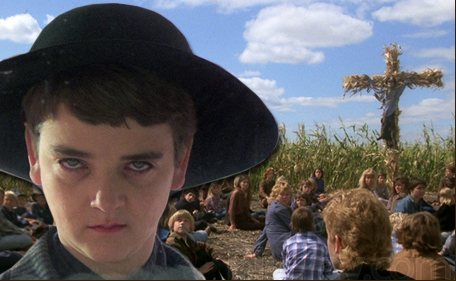 So… is religion really turning perfectly normal children into selfish, vengeful misanthropes? What anybody does at home is their business, but maybe we could make a secular schooling paradigm mandatory to level the field (i.e. forbid religion teachings in school)? I’d love to read your comments on this. Humans manage to live successfully in large societies mainly because we are able to cooperate. Cooperation rests on commonly agreed rules and, equally important, the punishment bestowed upon their violators. Researchers call this norm enforcement, while the rest of us call it simply justice, whether it is delivered in its formal way (through the courts of law) or in a more personal manner (shout at the litterer, claxon the person who cut in your lane etc.). It is a complicate process to investigate, but scientists managed to break it into simpler operations: moral permissibility (what is the rule), causal responsibility (did John break the rule), moral responsibility (did John intend to break the rule, also called blameworthiness or culpability), harm assessment (how much harm resulted from John breaking the rule) and sanction (give the appropriate punishment to John). Different brain parts deal with different aspects of norm enforcement. The approximate area where the stimulation took place. Note that the picture depicts the left hemisphere, whereas the low punishment judgement occurred when the stimulation was mostly on the right hemisphere. Using functional magnetic resonance imaging (fMRI), Buckholtz et al. found out that the dorsolateral prefrontal cortex (DLPFC) gets activated when 60 young subjects decided what punishment fits a crime. Then, they used repetitive transcranial magnetic stimulation (rTMS), which is a non-invasive way to disrupt the activity of the neurons, to see what happens if you inhibit the DLPFC. The subjects made the same judgments when it came to assigning blame or assessing the harm done, but delivered lower punishments. 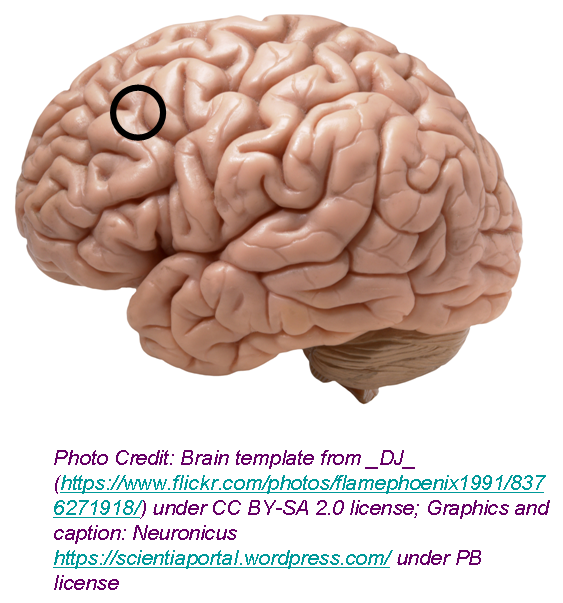 Posted on September 22, 2015 November 5, 2015 by NeuronicusPosted in 2015, Humans, Neuroethics, Social NeuroscienceTagged 2015, blame, culpability, DLPFC, fMRI, harm, Justice, PFC, Punishment, rTMS, Social.